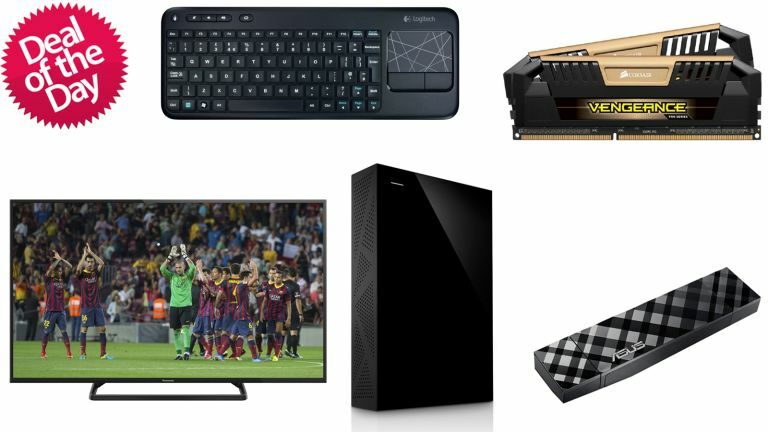 T3 Deals: Cheap TV, USB WiFi, DDR3, hard drives and lots more! We bring you enticing daily deals on tech, from tablets to cameras and games - don't miss out! Cheap TV: If you want a big TV but want to spend as little as possible, it's always better to go with a trusted brand. With that in mind, check out this awesome deal on the 50-inch Panasonic TX-50A400 1080p TV - it's down to £379 at Amazon. Wireless touch keyboard: Do you watch video or look at photos from your PC on your TV? Tired of having to get up to reach your mouse and keyboard? The Logitech Wireless Touch keyboard will sort you out and it's the deal of the day - down to £18 at Amazon. Wireless USB dongle: Is your laptop's built-in wifi a bit rubbish? Need a new wifi adapter for your PC? Check out the super-fast Asus AC56 dual-band USB 3.0 adapter - down from £75 to under £40 at Amazon. T3 Deals: Bluetooth speakers, portable chargers and a Laser Cosmos!